Camille Adams lost more than her husband when he was killed in a climbing accident five years ago. Before Jace’s death, Camille had been adventurous and daring. She and Jace had traveled, eager to try the next risky sport, to test their powers, and to meet each new challenge. But after his death, Camille became cautious and fearful of risks for herself and for those she loved. She is overprotective of her fourteen-year-old daughter, Julie, doing her best to protect Julie by eliminating risks from her life. Once a gifted and enthusiastic photographer, Camille stopped taking photographs and becomes known for her work with found film, winning fame for salvaged images of a shy First Lady, a species of penguins now extinct, and a murder in progress. Unwilling to let go of her idealized memories of Jace, she has moved through her years of widowhood controlled by her grief and fear, a shadow of the woman she used to be. Julie is troubled by more than the restrictions her mother imposes. The target of a mean girl’s bullying, she has grown isolated from her former friends. School is a torturous experience for her, and her grades have dropped. Finding solace in food she has gained weight and is convinced she is fat and freakish. She is an adolescent in crisis. Camille is slow to recognize Julie’s problems and can do little to help once she does become aware of them. The catalyst for change in Camille’s and Julie’s lives arrives in a trunk sent to Camille’s father from his native France. Photographs of her father as a child and of the mother who died when he was an infant reawaken old memories and raise questions about Henri Palomar before he became Henry Palmer. Henry decides to return to Bellerive and the farm he inherited for the first time since he emigrated to America at eighteen. Diagnosed with cancer two years ago, Henry is in remission, but the likelihood of a recurrence has given him a strong sense of his own mortality. He is determined to spend the summer in Provence, and he wants Camille and Julie to go with him. When Julie’s problems at school escalate, a summer in France sounds like the best idea for her, and Camille, already concerned at the idea of her father traveling alone, reluctantly agrees. The summer leads Henry to truths about his past, provides Julie with the acceptance and friendship she needs, and allows Camille to reconnect with Malcolm Finnemore, an American expert on tracing the provenance of lost soldiers and a visiting history professor at Aix-Marseille University in Aix-en-Provence. Not only does Finn possess the skills Camille needs to help her uncover her father’s past, but he is also the first man to remind her of all that she is missing by refusing to move on with her life. Woven into this mix of romance and family stories is the story of Lisette Galli Palomar, Henry Palmer’s mother, and her life during the Nazi occupation of Bellerive. Susan Wiggs has proven her talent for seamlessly linking stories of a family’s past and present in her Bella Vista Chronicles (The Apple Orchard and The Beekeeper’s Ball). She does so once again in Map of the Heart. Lisette’s story adds poignancy to a novel saturated with loss and recovery. All of the primary characters are dealing with loss on some level. Henry never knew his parents, and he has avoided connections to his past for more than half a century. Camille and Julie have lost their husband and father and their real selves. Julie has lost the smart, funny girl she used to be in the alienation and self-hatred that are byproducts of bullying. Camille has lost the sense of adventure and joy in living that were essential parts of who she was before she became paralyzed by fear. Finn’s preoccupation with recovering the remains of lost soldiers is intimately linked to the disappearance of his own father, a combat strategist and communications specialist who was declared MIA before Finn’s birth. But the book is also about healing and restoration and the power of love—romantic and familial. I’ve been a Susan Wiggs fans since the days when she was a writer of historical romance, and some of my Wiggs keepers date from that period. But I think her recent books that are essentially women’s fiction with elements of historical fiction, romance, and mystery are among her finest work. 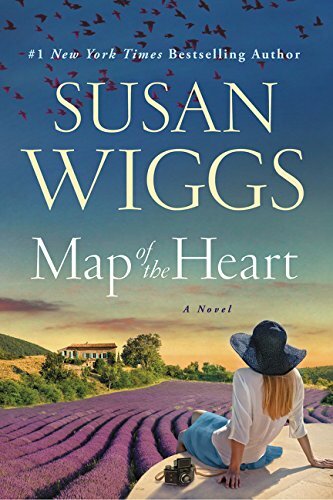 I loved Map of the Heart. Wiggs made Bethany Bay, Delaware, and Sauveterre, the Palomar farm in Provence, real to me. Not only Henry, Julie, Camille and Finn but also other characters in both the twentieth and twenty-first century sections of the novel come alive in these pages. I was invested in all their stories from beginning to end, and I turned the final page satisfied emotionally and intellectually. If you like novels that show the past impinging on the present, that deliver a big, multilevel emotional punch, and that conclude with happy resolutions for three generations, I highly recommend this book. This sounds like a wonderful read. The paths all of the characters are traveling are so relevant to many of us. Incorporating a bit of history suits me just fine. Knowing or searching for that past can have a big influence on your life. I have not read any of her Bella Vista Chronicles but I will be looking for all of them. Pat, my apologies if I gave you the wrong impression. Map of the Heart is not part of the Bella Vista series. However, it is like the Bella Vista series in its blend of past and present and its WW II connections. All three books were wonderful reads. No problem. I have just read her historicals so this will be a nice change. I have been looking forward to this book...Can't wait! I hope you enjoy it as much as I did, deerdoe. THANK YOU. ADDED IT TO MY LIST. FOR SOME REASON, THOUGHT THIS WAS SAME BOOK AS HER PREVIOUS NEW RELEASE WITH A TITLE CHANGE. LOL. NOW I HAVE 2 NEW ONES OF HERS TO READ. Thanks for the review. The plot is just exactly what I like - challenging and involving and wonderful. I loved her Bella Vista Chronicles books! This sounds like a wonderful book. I am only now discovering Susan Wigg and her books. I loved her Bella Vista Chronicles! I'm looking forward to reading this book.